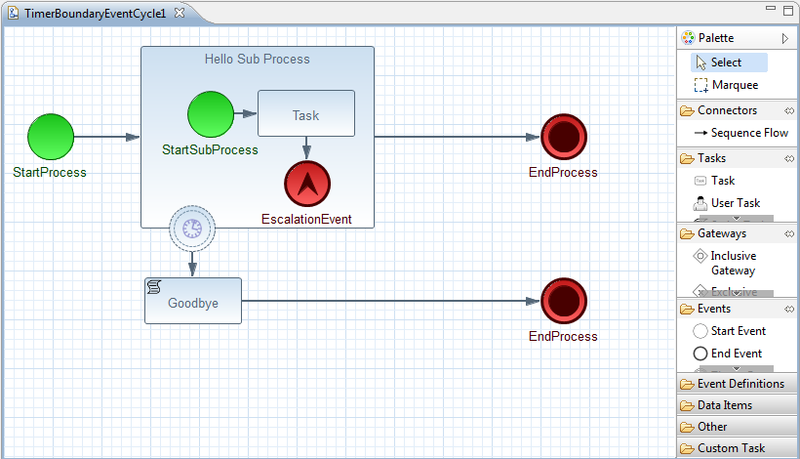 We would like to introduce our new Eclipse editor for defining business process in Eclipse (using the BPMN 2.0 standard). 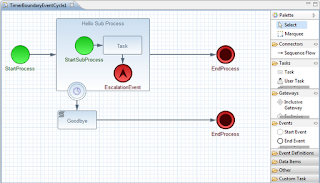 This editor will offer support for the full BPMN2 specification, and currently offers support for at least the same constructs as the previous plugin. We will continue to extend it over time with all the other constructs the jBPM core engine already supports, but we would like to hear your feedback as well ! The web designer received a lot of love as well, with new features like user-friendly property editors, color themes, a dictionary, inline form editing, etc. The jbpm-human-task module has been split up in a jbpm-human-task-core module and sub-modules for the different transport protocols available (hornetq, mina, jms), and a separate war that can be deployed in the application server (and is made easily configurable now). The installer now uses the war (with HornetQ) by default. Integration between the jBPM console and Guvnor has been upgraded, to support new packages being added in Guvnor, removal of processes, etc. The human task module now supports escalations and notifications. Lots of persistence improvements to better support different databases, and we're using a new serialization technology (Protobuf) to better support upgrading / migration in the future. You can download the release here (if you're not sure what you're looking for, downloading the full installer and then following the installer chapter to set up your environment and run through the tooling with a simple example is probably a good idea), or browse the documentation and javadocs. jBPM 5.3.0.Final has been released in sync with the latest Drools 5.4.0.Final release. We're still updating our docs and writing some blogs on the new features as we speak, so you can expect more updates from us soon! Well done. It is good to see the progress. Are you planning to visit Australia again in the future? A first version of the form builder has been released as well. Where is the builder,how to use it? I have the issue and wait for your answer to sove this. Does jBPM 5.3 have support for JPA 2.0 specification? One of the area that affected by this problem is that it causes the report cannnot be loaded from the bpm web console . Please confirm if it is a bug. If yes , I suggest that it 's better to warn user that jBPM 5.3 final release version cannot work with jboss 7.1.X in order to prevent new users from wasting their time and have bad experience when trying jbpm5.3 with the jboss 7.1.X . Especailly , you should delete this remark " if you move to 7.1, don't forget to change the following line (7.0 -> 7.1) " from build.properties as this remark causes user think that it will work with jboss 7.1.X but actually it does not. Most importantly , any workarounds exist now if it is a bug? so how does one dowload it? "You can download the release here (if you're not sure what you're looking for, downloading the full installer and then following the installer chapter to set up your environment and run through the tooling with a simple example is probably a good idea), or browse the documentation and javadocs."